After another extensive and delicious lunch I accepted Indu’s invitation to a short trip to her “office” in Zurich, where we spent a comfi evening with 2 inspiring DVDs (”The Peaceful Warrior” and “Hero”). Next morning, after a short 20 min. run, we went for a second New Year’s plunge in the Zurich lake (we forgot our watches – maybe 7 min. in 4°C with cold winds) – with snow-powdered Uetliberg in the distance. After a hot bath and some breakfast we collected Indu’s mother and sister and drove off to the winter magic of Einsiedeln, about 40 min. driving distance from Zurich. Einsiedeln means hermitage and is the site of a world-famous Benedictine monastery and a small but exquisitely beautiful lake. SNOW, finally! The weather was gloomy at first, but it was magic anyway. However, after an hour or so the sky cleared and the sun came out and created an unbelievable winter fairytale landscape. After a leisurely walk/run along the lake and some hot soup in a little hut we visited the amazing baroque abbey church (no photos inside!) in Einsiedeln – one of the sacred places in the world, stood in the “power circle” in the church center and meditated briefly in front of the “black Madonna“. The culmination of the little trip – at least for me – was a quick dip in the partly frozen-over lake, after finding a gap in the fence surrounding the lido. I would have loved to stay longer, but we wanted to get back to Heidelberg for a special meditation in the evening. 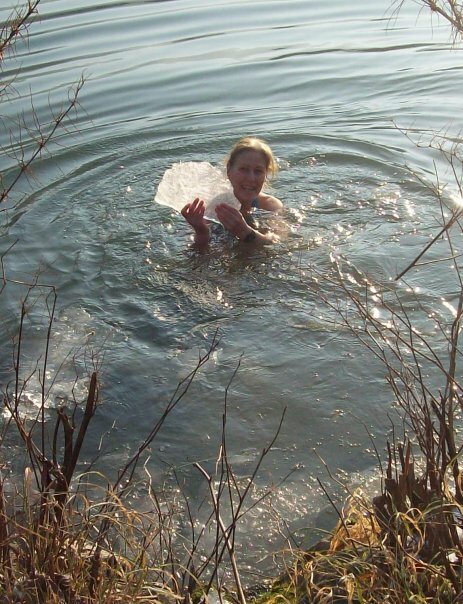 Still an absolutely great start into the New Year – with three times more cold swims than last year! To top everything off: I am now first place with Eddie on the tide starting Aug. 30th! (Apart from the Arc to Arc triathlon relay competition with different teams on that tide which would have priority.) Will this be my Dover-Heidelberg year, finally? 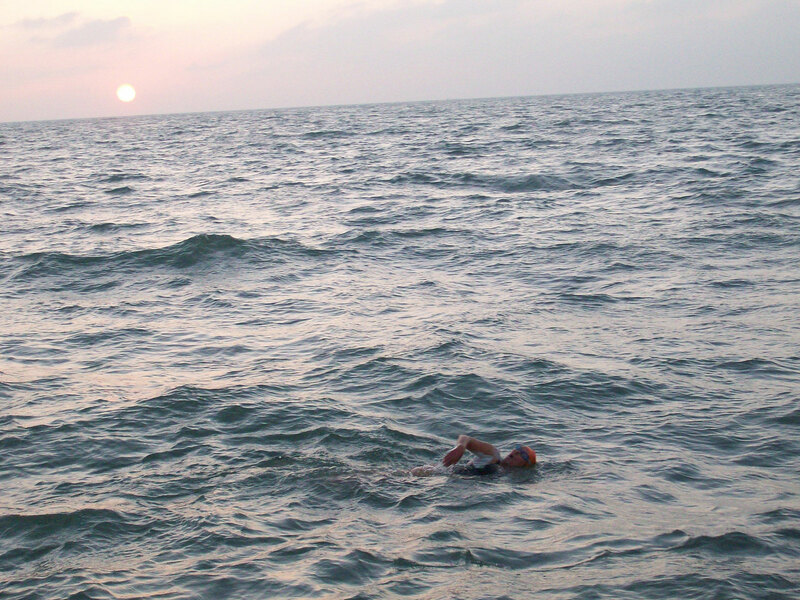 Only a few solo swimmers have succeeded in their crossing so far for this year. Relays can manage better with more difficult weather and tidal conditions – except for the seasickness on board! 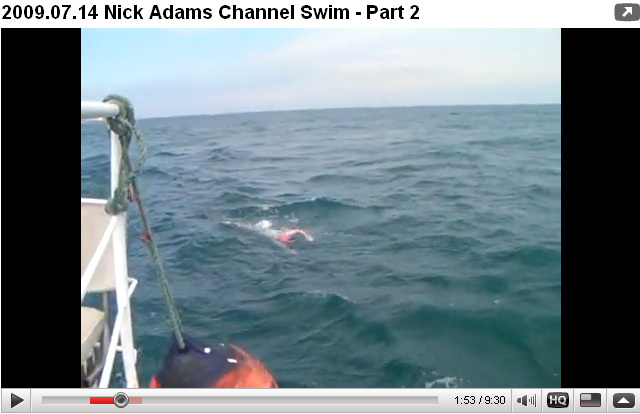 Nick Adams – accomplished 4 times Channel soloist now and even one time 2-way Channel swimmer – did not have an easy time on his 4th crossing: 5 hours in windforce 5 is no joke! Very well done for staying in there and not giving up (he may be forgiven for throwing up on the video, cause the windforce 5 part could not be filmed or photographed for understandable reasons, and the end of the video may just convey a bit the drama). Unfortunately there is no video or photos available for Sophie Rutenbar of the Serpentine Club (they swim in the Serpentine in Hyde Park the middle of London even in the midst of winter in snow), who conquered the same conditions in a great time of 14:33. Russian Ice Swimmers -are you sure you are well prepared for the Channel? Since last September, my swim training has been pretty reduced, but I put on some more weight, without much effort, and was happy to find that running is still possible at 85 kg (my weight of 1985, last year it was only 77 kg) – although it may be easier in winter than in scorching heat in summer, but now my first and foremost goal is the Channel – the rest will work somehow. I am trying to acclimatise better to cold water this year and plan to use the Neckar and a nearby lake quite a bit more. 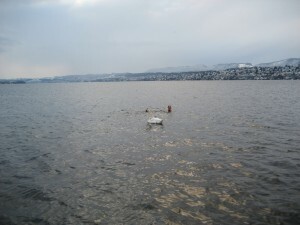 Today, pool training started, with a view to participate in the 12 hour indoor swimming event in Zurich on March 1st.